Unloading stone in Fairport, June 5, 2010. 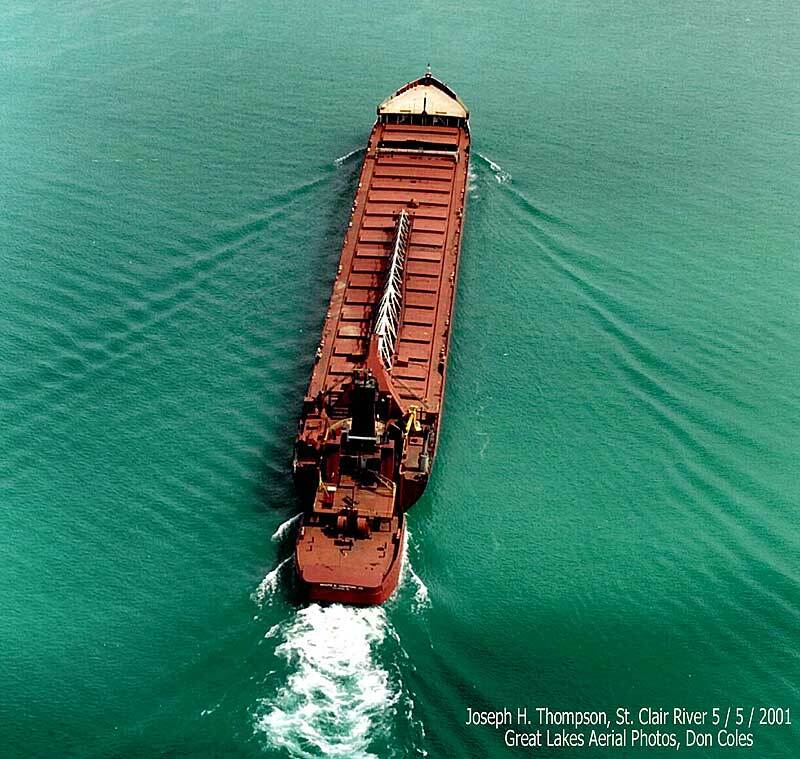 The Joseph H. Thompson proves to be one of the most historic vessels on the lakes. She has served in wartime and peacetime both on the ocean and the Great Lakes. She was originally built by Sun Shipbuilding and Dry Dock in Chester PA, early 1944 as the 515 foot C4-S-B2 Cargo vessel Marine Robin, hull #342 for the U.S. Maritime Commission for the World War II effort. The Vessel was powered by a 9,900hp G.E. steam turbine. 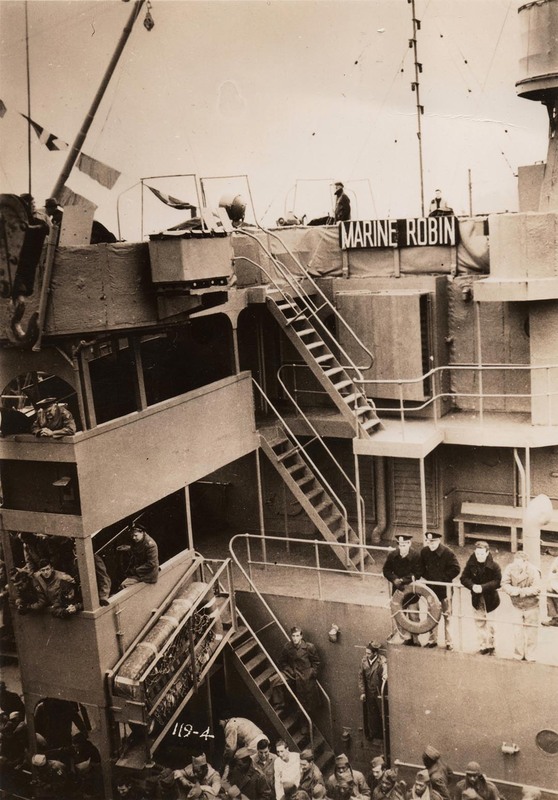 As the Marine Robin the Thompson made cross-Atlantic voyages for the war effort and was present at the Normandy invasion June 6, 1944. After the war the Marine Robin and her C-4 cargo sisters were put into mothball fleets all along the east coast. Shortly after the start of the Korean war in the early 1950's the demand for iron ore skyrocketed. The Great Lakes fleet owners struggled to keep up with demands. Shipyards on both the American and Canadian side were backed up with orders for new hulls. 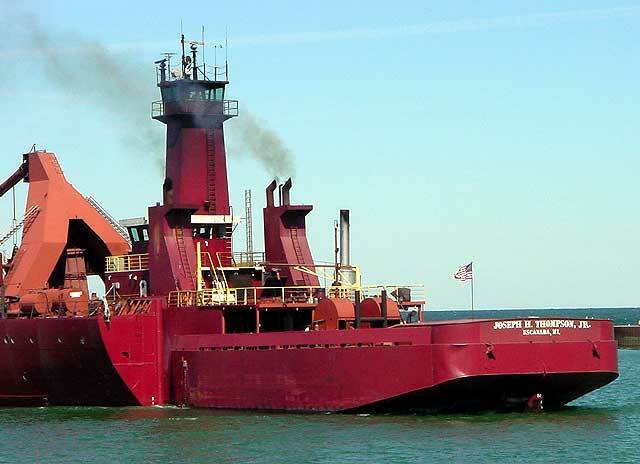 Several companies looked to former ocean vessel as there answer for instant tonnage. 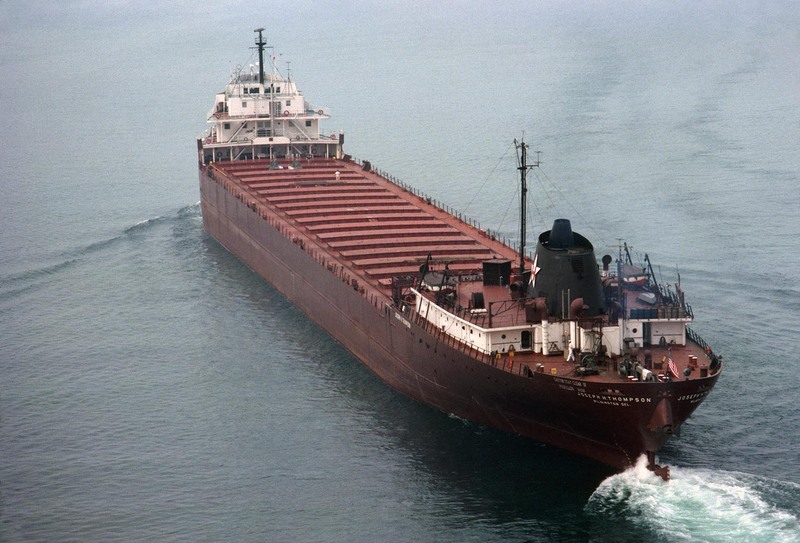 Cleveland Cliffs started the trend by Purchasing the 455 foot Victory Ship Notre Dame Victory and converting her into the 620 foot lake bulk carrier Cliffs Victory (She would eventually be lengthened to 716' 3"). 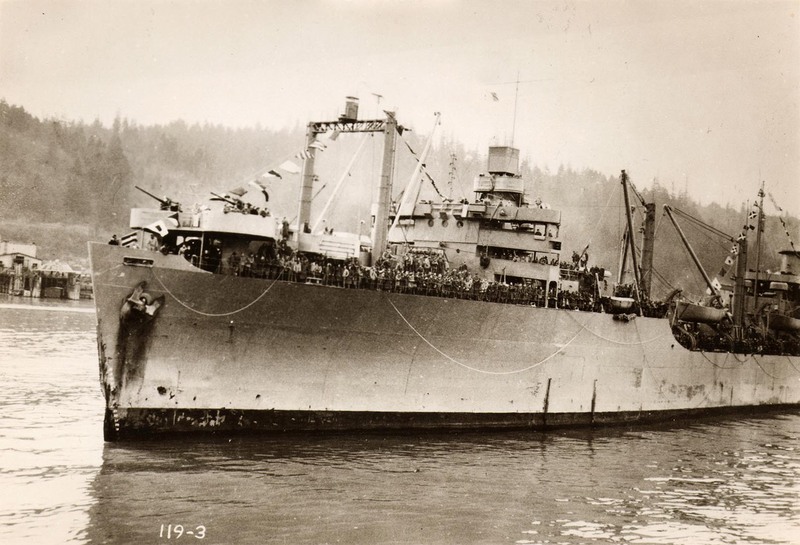 Slightly shorter and with a smaller beam than the C-4's, the Victory proved the ex-Sea going vessels provided a fast fix to the need for more hulls. 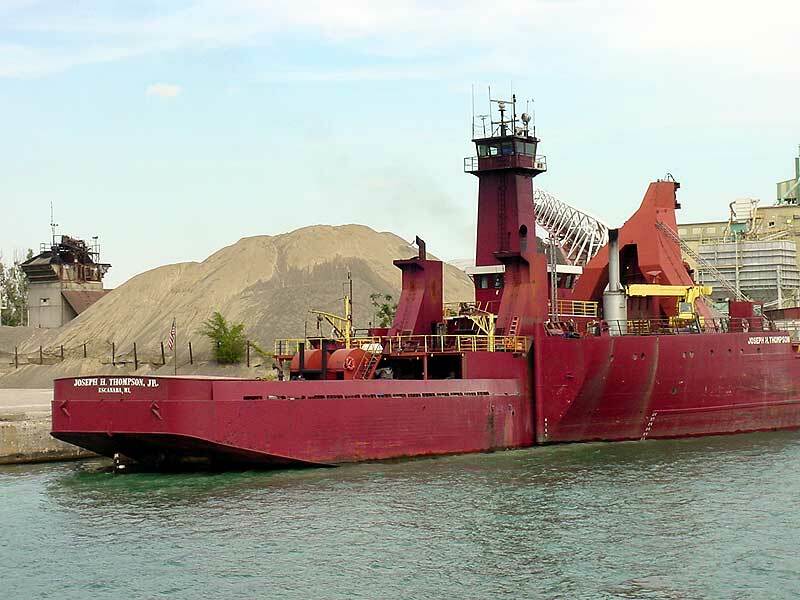 Following Cleveland Cliffs example several other U.S. and Canadian companies purchased excess ocean vessels. 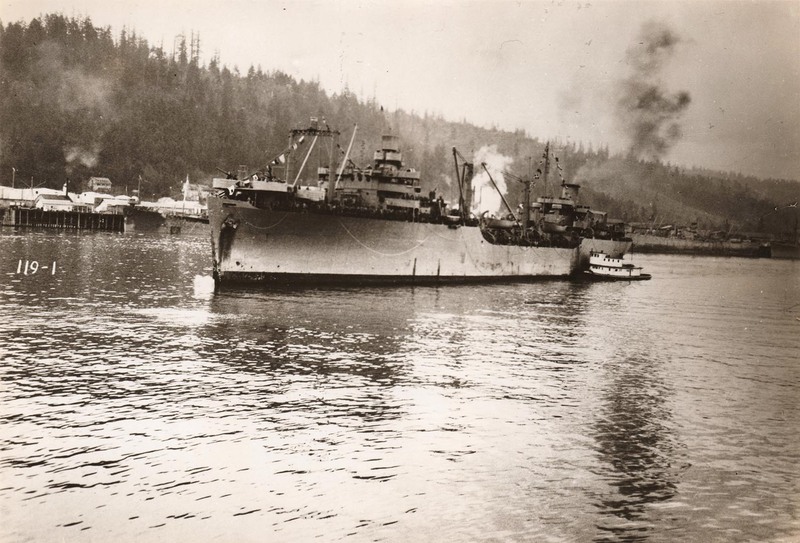 The Marine Robin along with her C-4 sisters Louis McHenry Howe, Scott E. Land, Marine Angel, and Mount Mansfield were all slated to be converted for lake service. 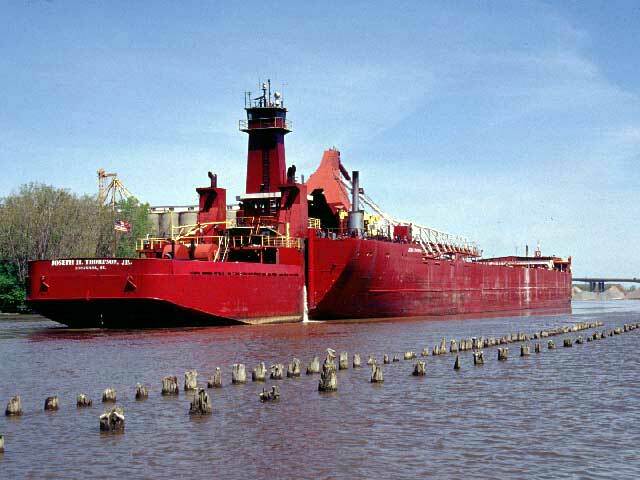 The Robin was purchased by the Wisconsin-Michigan Steamship Co. of Milwaukee in 1950. She was then sold to Hansand Steamship Co. (M.A. Hanna managed) of Cleveland. 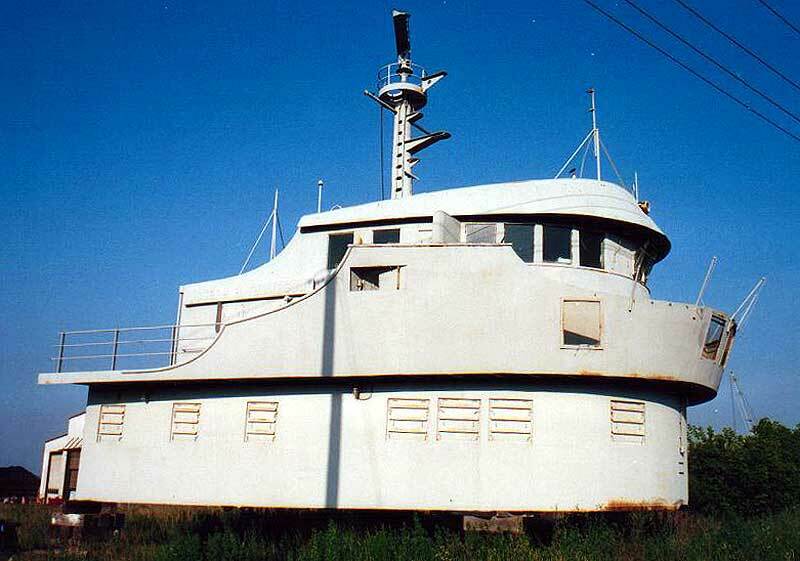 She was converted in 1952 by the Maryland Dry Dock Co. in Baltimore. The Robin was given a new 199' 3" mid-body built Ingalls Shipbuilding Co. of Pascagoula, MS, and had her deck houses converted from mid-ship style to the traditional fore and aft cabins. Her original G.E. turbine was retained. 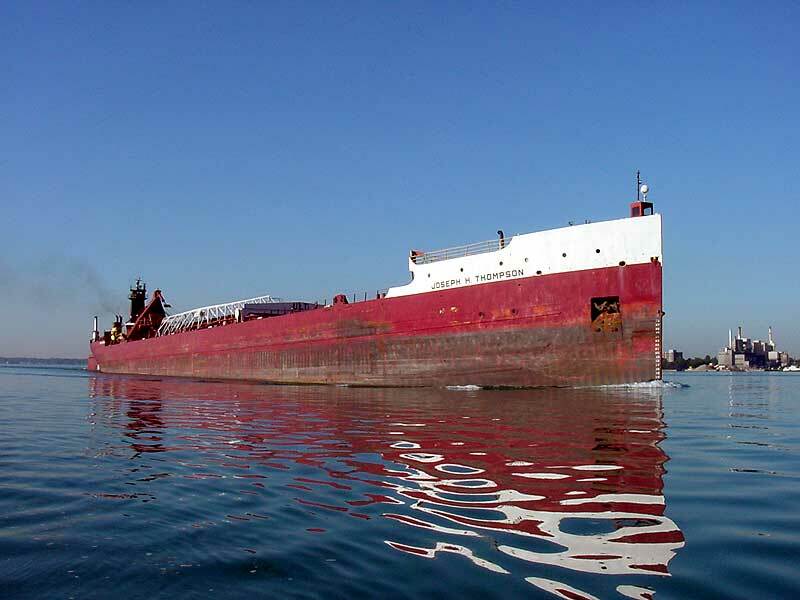 The now 714' 3" vessel was towed up the Mississippi river and the Chicago canal system in two sections so they could clear the locks on both waterways. 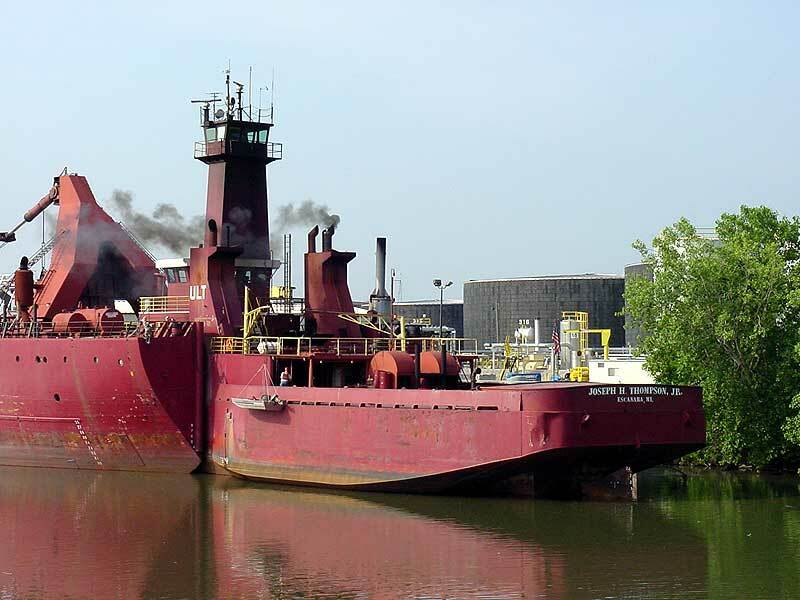 The vessels long complicated journey to the lakes ended at the American Shipbuilding yard in Chicago IL. There the two sections were rejoined and as they were the new steamer Joseph H. Thompson (U.S. 245496) became the new Queen of the Lakes and the largest freight ship on Earth at 714' 3" in length, 71' 6" wide and 38' 6" deep. The Thompson took to the water on November 1952 and continued to serve her owners until 1981 when the bottom fell out of the ore market sending her and several other fairly middle age vessels to the wall. 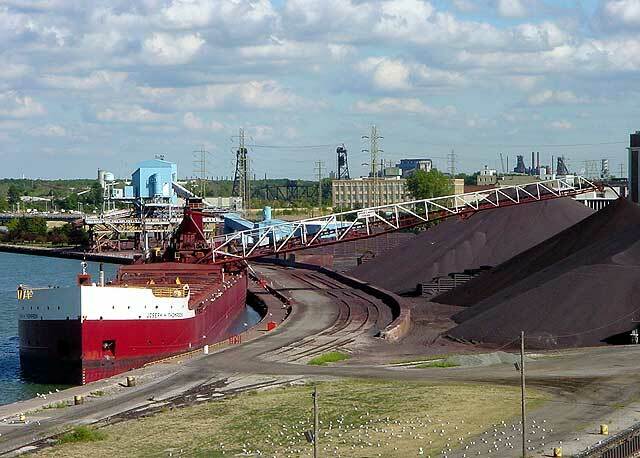 The Hanna Mining fleet sat idle in Detroit for most of the early 80's due to the lack of cargo. 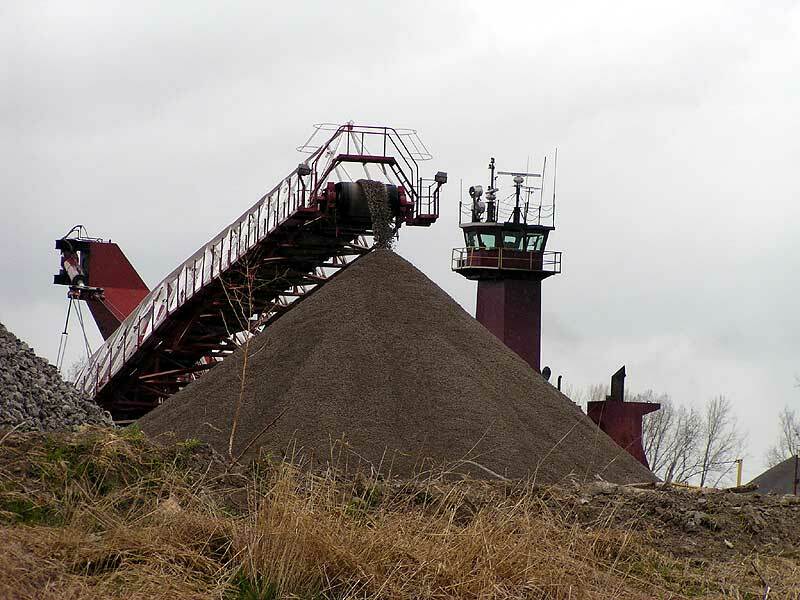 Hanna mining made the tough decision to abandon their marine transportation services after nearly 100 seasons on the lakes. The fleets vessels were put up for sale, even the companies nearly new 1004-foor George A. Stinson was offered at a discount, but to little interest. One by one the classic Hanna vessels were towed off the lakes to the cutters torch. 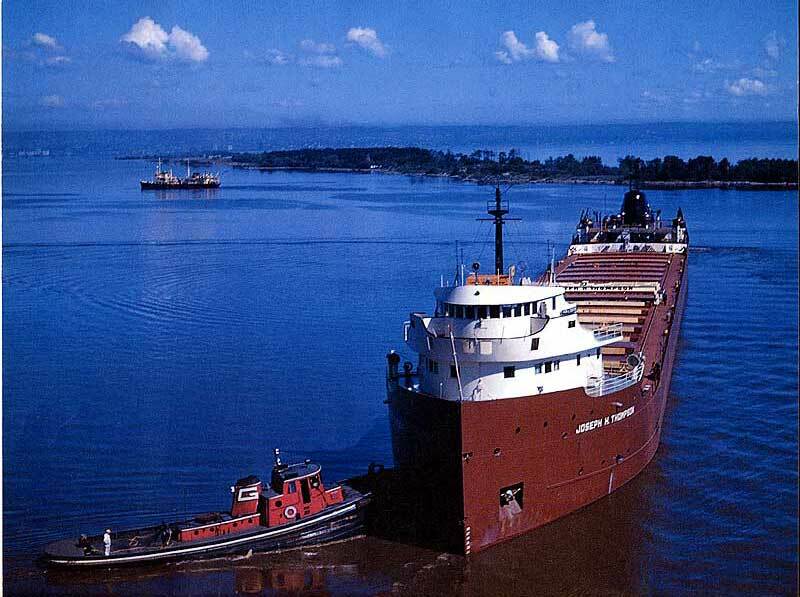 The 710' George M. Humphrey (first American laker with a 75 foot beam), and the 730 foot steamers Leon Falk Jr. and Paul H. Carnahan (Both converted WWII T-2 tankers) all had a date with the salvagers in the early 80's. Most of the vessel community believed the Thompson's number was up next. 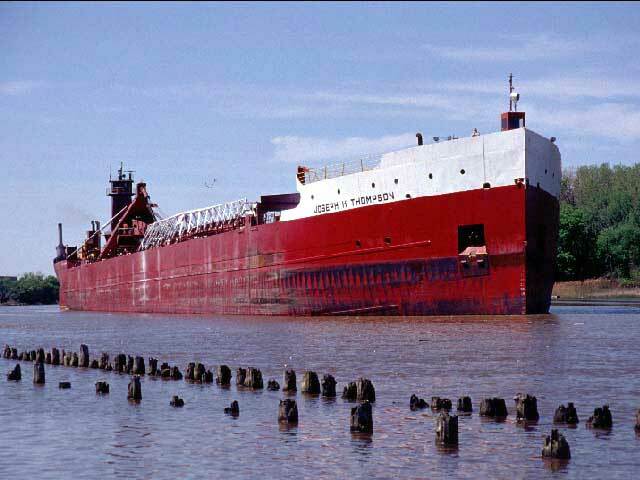 In 1985 Escanaba Michigan's Upper Lakes Towing Co. purchased the steamer and announced their plans to convert her to a self-unloading barge. ULT had successfully converted the smaller self-unloader/crain ship Buckeye and planed a similar conversion for the Thompson. 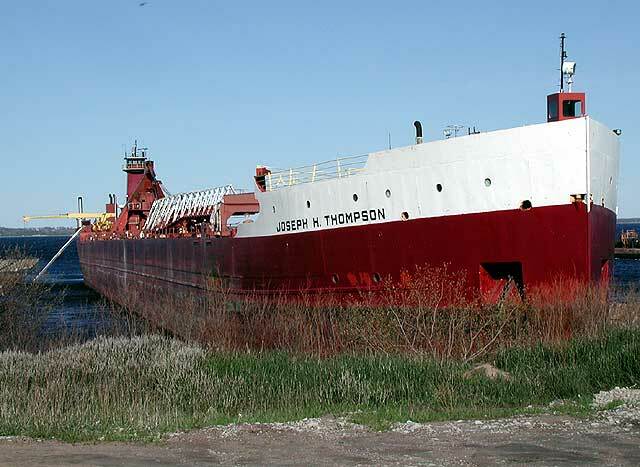 Shortly after ULT bought the Thompson, its conversion was started at Menominee, Bay Shipyards, and Escanaba. The aft and fore cabins were removed and the hull was shortened to create a notch for her push vessel. A stern mounted bucket style self-unloading system was also added. 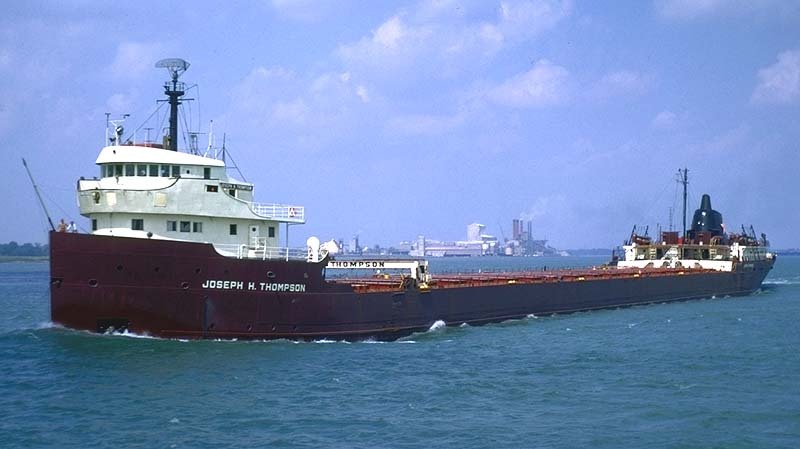 Her push tug, the 146' 06"/38'/35' Joseph H. Thompson, Jr., was constructed in 1990 from the left over steel from the larger ship's hull. The tug is powered by three G.M. diesel engines delivering 7,500 bhp. In 1991 the conversion was completed. 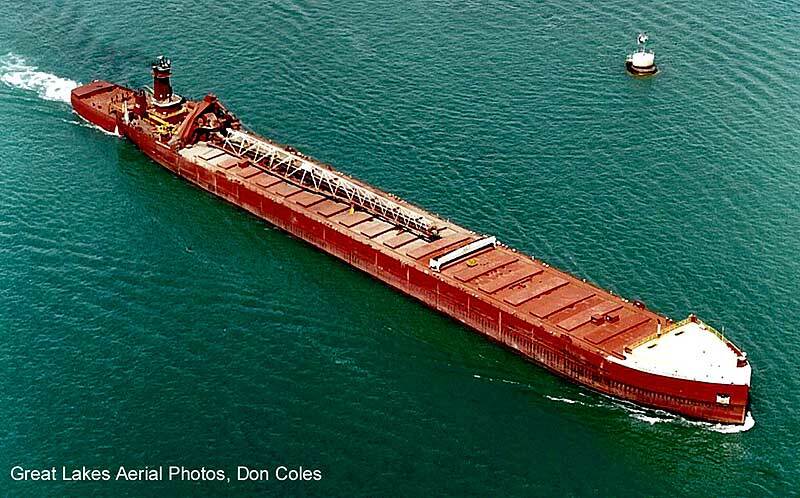 A year later her C-4 sister McKee Sons also entered service as a self-unloading barge for the same managers, making the Thompson and the McKee Sons the last two C-4's operating on the lakes. The Thompson was now 706' 06" long with the same beam and depth as before and with a capacity of 21,200 tons. Operating as a self-unloader she can engage in more trades to more ports than in her steamer days. 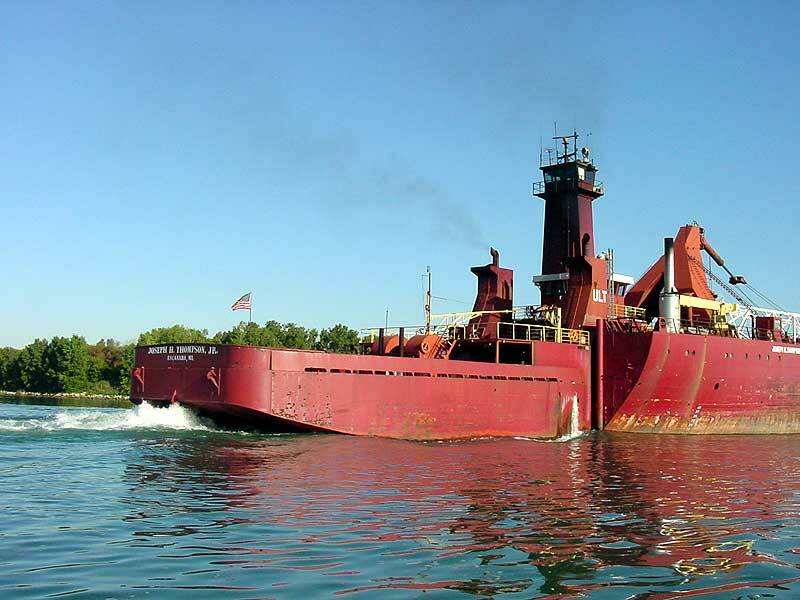 The cost efficiency of her reduced crew has kept her active every season since her conversion, and is a strong statement in favor of tug/barge units, but no matter what side you take, in the end a classic and historic vessel continues to ply the waters of the Great Lakes. Marine Robin being assited in an unknown harbor. 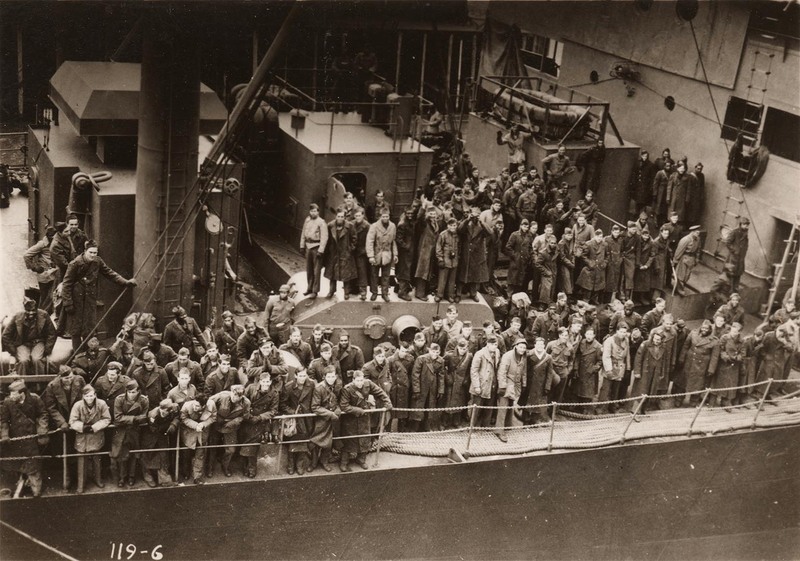 A full load of troops. 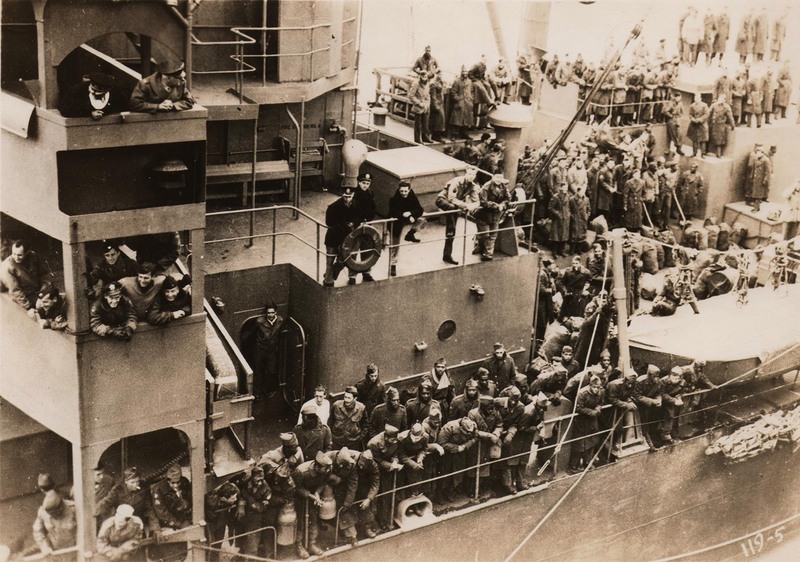 Possibly coming home from WWII. Back side of the pilothouse. Marine Robin 1952 conversion photos. 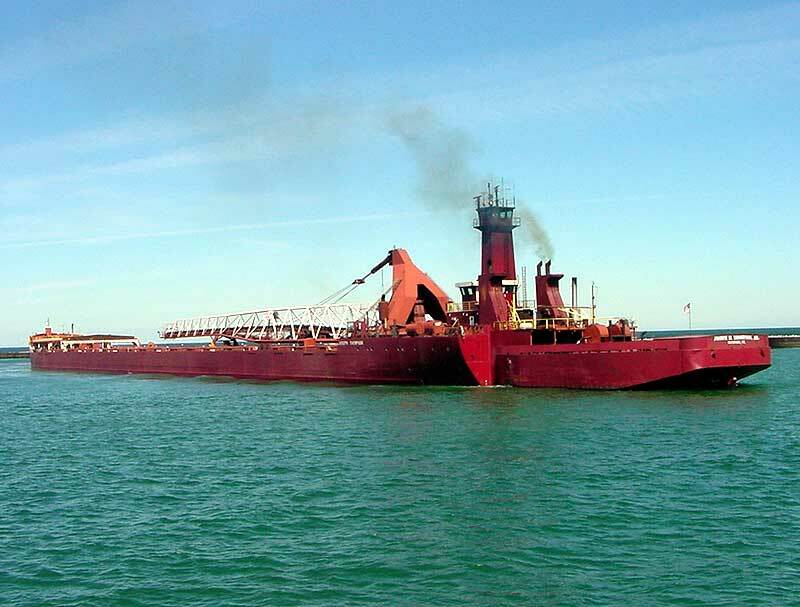 Allouez backing from the Great Northern ore docks assisted by the tug Illinois, 1957. Underway in the Detroit River, Sept. 1968. Aerial stern view, July 1976. 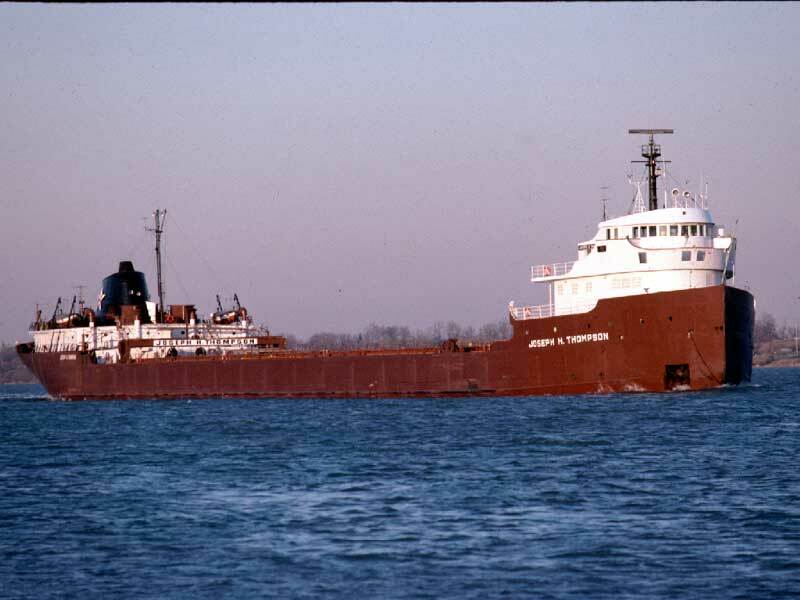 Upbound in the Huron Cut, Aug. 1979. Stern being converted into a tug and notch, Sept. 1985. 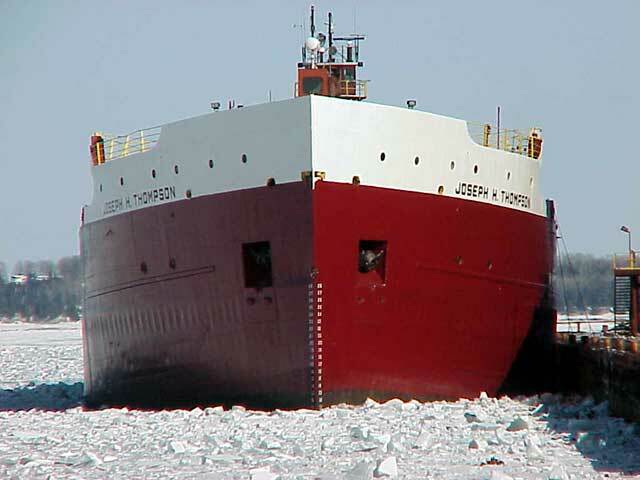 Bow close up in Escanaba, March 11, 2001. Aerial view underway, May 5, 2001. Backing into Lorain, Sept. 4, 2001. Stern view, Sept. 4, 2001. 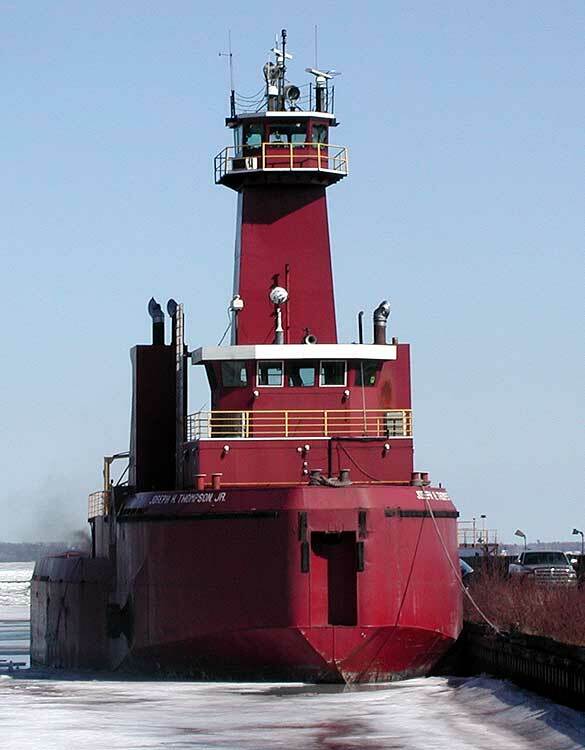 Pilothouse at the Basic Marine yard in Escanaba. Unloading Lorain, Sept. 4, 2001. Saginaw River, May 15, 2002. Rouge River, Sept. 25, 2002. Tug out of notch, March 18, 2003. Rouge River, July 8, 2003. Detroit River, Sept. 6, 2003. 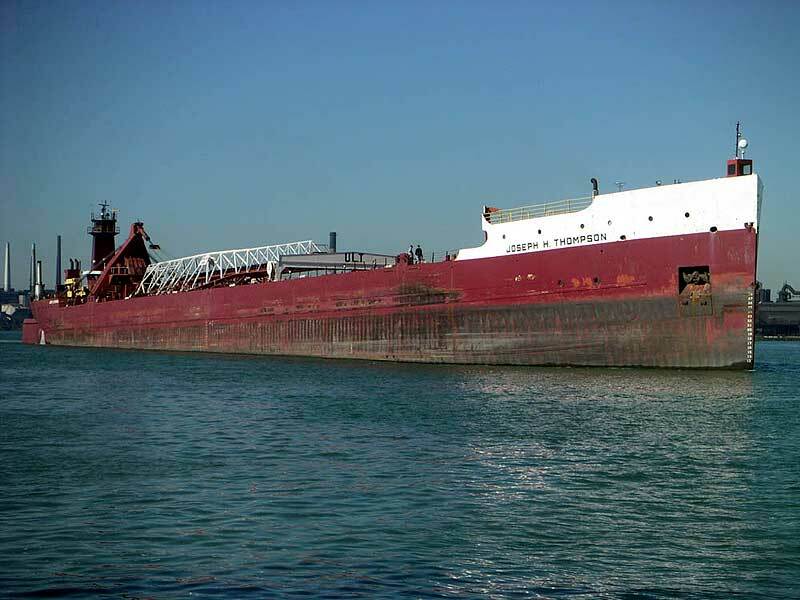 At the Brennan Street Dock in the Rouge River, April 27, 2008. Tug out of the notch. Loading salt at the Haridon Dock in the Rouge River, Oct. 31, 2008. Stern view with the unloading boom out. Close up of the tug & barge. 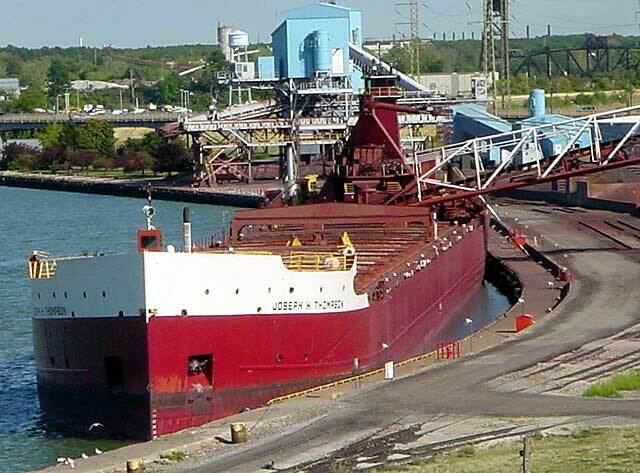 Loading at Port Dolomite in Cedarville, July 31, 2012. Dead on view of the stern.